I won't go into the emotion behind my baby turning one. Suffice it to say, I really can't believe it's been a year. Le sigh. This took less than a skein of Tahki Cotton Classic in blue and white and the flame was some yellow Knit Picks Palette leftover from my Dipped Infinity Scarf. My cute little bug. Awww. So cute! Happy Birthday! My baby turned 5 on Saturday. Sigh is right. oh my gosh! so cute! happy birthday to your sweetie! He looks adorable in his birthday hat! AWWWWW! They grow so fast....in two weeks, you'll have to hand over the car keys! 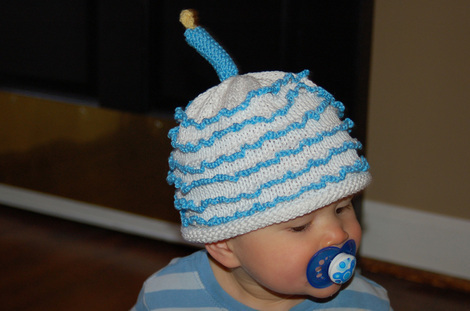 What a darling hat for a cutie pie kid. love the birthday cake hat! 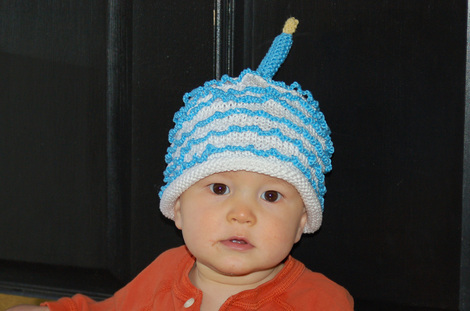 What a sweet little hat - Happy Belated Birthday to your little one! This page contains a single entry from the blog posted on March 6, 2011 11:11 PM. The previous post in this blog was 52 Photos - Up. The next post in this blog is Socks Without the Work.